VERGE Hawaii was held in Honolulu from June 11-14, 2018, attracting attendees worldwide interested in learning about the state-of-the-art in the energy industry. Professor Jason Leigh, director of the Laboratory for Advanced Visualization and Applications (LAVA), and his graduate student Ryan Theriot presented a talk and a panel on their visualization tool for understanding Hawaiʻi’s plan toward utilizing 100% renewable energy by 2045. 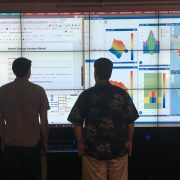 The software, HAVEN (Hawaiʻi Advanced Visualization Energy/Environment Nexus, was developed by Master’s students Ryan Theriot, Anson Yu, and ACM undergraduate student Kari Noe of LAVA in collaboration with the Hawaiʻi State Energy Office, Department of Energy’s National Renewable Energy Laboratory, and the Hawaiʻian Electric Company. The project was enabled through funding from the Hawaiʻi State Energy Office, Department of Energy, and the Academy for Creative Media System.